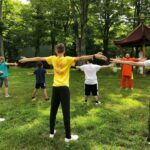 “Chan Quan Yi Ti”: Martial Arts and Chan Philosophy are but one thing. The body is the mind; the mind is the body. They cannot be separated. 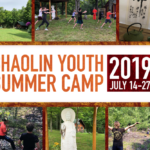 Throughout the history of the Shaolin Temple, there have been many famous legends and myths that are the source of rumors and beliefs about the abilities of the Shaolin Monks. Perhaps the most famous of them is the story of how thirteen monks saved the life of emperor Li Shi Min, who in return offered many gifts and honors to the Shaolin Temple. When he was in power, he gave 40 qing (660 acres) of land to the Temple, a Ziluo Jiasa (purple robe) to each monk, and all of the monks received the title of General. The Temple was also allowed to have its own army. If you can visit the Shaolin Temple you’ll see some remains and relics that still talk about those times. One of them is a great large, green stele (stone monument) that the Emperor himself signed. There are also two trees that go almost unnoticed by the common people. Few people know that those trees were there on the day the Emperor gave out the titles, and therefore also received the title of General, along with the monks. They are Da Jiang Jun, “Great General Tree”, and Er Jiang Jun, “Second General Tree”. They are thousands of years old, and some of the monk’s staves have been cut from them. This example from the history of Shaolin is a great example of “Chan Quan Yi Ti” (Literally the fist and Chan are one body). 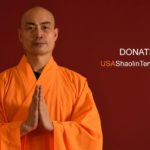 The blending of Chan Buddhism and Martial Arts is what coined the saying “Shaolin quan bang tian xia wu lin zeng zong” (The Shaolin fist, and the Shaolin staff are the best under the sky). 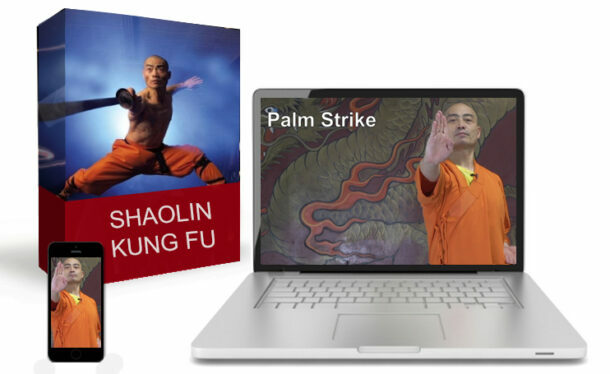 The Shaolin monks have practiced the hand and staff forms for thousands of years. The word “monk” is a synonym of peace, of compassion, of harmony, of intelligence, but above all of a great responsibility towards people, helping others, sharing the philosophy with others and understanding the suffering of others. It is for this reason that when the Shaolin monks needed to go to war, to stop violence, or were forced to fight, they avoided using weapons that could easily kill people, such as swords or sabers. It was better to use Chin Na (catching and locking) or Dian Xue (Dim Mak in Cantonese – pressing arteries and specific points to leave the enemy unconscious) techniques, and in extreme cases, to use the staff to knock out the opponent. They hoped that when he woke up, the opponent would realize that his fighting was unnecesary, and understand that killing others is bad. At worst, when he woke up, there would be nobody there. The monks said that the fallen man should realize that his fighting had been useless and learn from that. This way he would become a better person. In addition to this, the Shaolin staff became a very common tool. When monks traveled, they did not like to carry weapons, but a good staff is also a good tool to move obstacles on the way, jump across a stream, or to use as a cane when one is tired. Every style has its own way to improve on its techniques and advantages, and they also show a way for the practitioner to improve himself: “Qiang Za Yi Tiao Xian, Gun Da Yi Da Pian.” This phrase means that practicing with the staff helps the practitioner develop a sense of space and what is around him, since it is a weapon that moves in all directions. A spear, on the contrary, goes in a straight line. 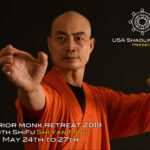 There is a saying about sabers that goes “Dan Dao Kan Shou” (When using a saber, watch your hands), and “Shuang Dao Kan Zhou” (When using two sabers, watch your elbows). Even though these weapons are also used in Shaolin, the staff is the most popular and is considered the chief weapon of Shaolin. Many of its movements take advantage of its qualities, like the fact that it can be held from any of its parts and used in all directions. This allows the practitioner to dominate a wider range and make stronger blows, due to the force it obtains when used in certain ways. The staff’s flexibility is another important factor, since it obtains some additional strength as it is waved towards a target. Also, though the staff may not be sharp like the a sword or pointy like a spear, it has the same effects when it is used as such. A direct blow given as if it were a spear may be just as powerful. It also enables the practitioner to swiftly attack from different directions. “Yan Guan Liu Lu, Er Ting Ba Fang” – The eyes can see six directions, the ears can hear in eight. At a certain level, you don’t need to see all around you, but your senses develop enough so that you can be aware of what is around you just from hearing it. In many staff forms and exercises, there is a part where practitioners must move the staff in graceful, elegant shapes in eight different directions, spinning it with power and dexterity. Many people think that these exercises are made simply to show or boast one’s abilities, but each movement was put there for a specific reason. The practitioner must do these movements with great speed, because while performing them the staff must be used like a baseball bat to shoot rocks and other objects towards the opponents. Each movement must be done always pushing oneself over one’s own limits. The movements of the staff have originated some legends. It is said that when spinning the staff very quickly, with the right movements, you can create a sort of shield that will protect you. That is, since the staff spins so quickly in every direction, there is no way to go through it without being hit. It is said that even when the enemies threw rocks or objects to attack the monks, they could not reach their target. They were repelled by the staff. The saying “Feng Yu Bu Tou” means even wind and rain can’t get through. Legends tell of a monk you could throw water at, and he would not get wet. He would repel all of the water – “Po Shui Bu Tong”. This belief or philosophy is what really defines what the staff practitioner must have in mind when practicing. You must push yourself to the limit, reaching what may seem like myth. This constant challenge is in itself what confers mastery of the staff. In Shaolin everything has a sense, everything has a way and an explanation. 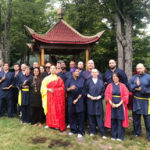 Just like in the saying: “Chan Quan Yi Ti,” Chan philosophy is not solely expressed in prayers or in meditation; it is expressed in every sense and in martial arts. The martial arts movements have a double meaning: the martial sense and its foundation in Chan. For example, there are movements in the staff forms where it looks like the monk is cutting grass, as if the staff were a machete or shears. In combat, this movement is used to make the enemy fall by striking his heels. But this movement has a foundation which practitioners must always remember: to cut the grass in their lives, which means to see things more deeply and clearly, without the grass covering them. For the monks, the grass also represents the bad things we have to clear from our lives.